Do you suffer from irrational fears which impact your everyday life? Do you suffer from irrational fears which impede your ability to enjoy everyday life? Do you find yourself doing everything to avoid being exposed to your fears? Do you have even more than one phobia? Many Australians suffer from phobias, and worryingly, most of them never seek help. Overcoming a phobia is a daunting idea, as it involves coming to grips with the things you fear most in this world. Thankfully, phobia hypnotherapy is a proven and effective method to treat phobias; resulting in long-term relief from these debilitating fears. Phobias are a fear of an object, animal, situation or even places, which can be debilitating and very real for the sufferer. As opposed to normal and rational fear, which keeps is safe and helps us to avoid dangerous situations, phobias are irrational in nature and can prevent sufferers from living a full and happy life. Phobias are actually an anxiety disorder, which results in an extreme fear, and can be effectively treated with hypnotherapy. As many as one in ten Australians suffer from phobias – in fact, some sufferers exhibit multiple phobias. These phobias are difficult to live with, and can sometimes make it difficult to interact with family and friends, go to work, and even leave the house. If left untreated, phobias can develop into even more severe conditions, and even lead to depression and self-harm. 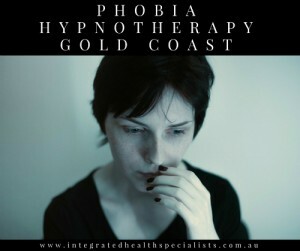 At Integrated Health Specialists, we have developed a targeted and effective phobia hypnotherapy programs, which are aimed at dealing with the unconscious causes behind your fears. Sufferers of phobias are often aware that their fear is irrational and yet they are unable to do anything about it. Those around them might be dismissive of the sufferer’s fear, and tell them simply to ‘not be silly’ and try to rationalise the fear. The difficulty is that phobias are irrational and persistent by their very nature. No amount of rationalising from friends and family can help someone who has a true phobia. Phobia hypnosis is a safe and effective method developed for treating the root causes behind phobias, by addressing the conscious and unconscious thoughts and behaviours which lead to the development of a phobia. By putting the sufferer in an extremely relaxed state, phobia hypnosis can help to manage the fear, and ultimately overcome it. 1. Identify the specific phobia that you want to change. At Integrated Health Specialists, our phobia hypnotherapy programs have helped countless sufferers to address and overcome their phobias, and go on to live fulfilled lives free of their previously debilitating fears. CONNECT WITH US TODAY to find out more!